If you are looking for a used Subaru Forester in Vancouver, North Vancouver and surrounding area, the Goldline Motors sales team will be able to satisfy your needs. Goldline Motors always has a great selection of pre-owned Subaru Forester in stock and add to the vehicle inventory daily. At Goldline Motors we proudly sell used Subaru Forester to customers from Vancouver, North Vancouver, Richmond, Burnaby, Surrey, New Westminster, Coquitlam, Delta, Abbotsford and Victoria. The Subaru Forester is a crossover vehicle that blends many of the best attributes of a sport-utility vehicle with the ride and driving dynamics of a car. It offers the capability of Symmetrical All-Wheel Drive, as well as a versatile rear cargo area with liftgate, underfloor storage and up to 68 cubic feet of cargo capacity. The Forester is available in six trim levels: 2.5X, 2.5X Premium, 2.5X Limited, 2.5X Touring, 2.5XT Premium and 2.5XT Touring. All trim levels are equipped with a 2.5-liter horizontally-opposed four-cylinder engine; in "X" variants, the engine is naturally-aspirated and produces 170 horsepower, while both "XT" variants generate 224 horsepower, compliments of an intercooled turbocharger. The 2.5X and 2.5X Premium get a 5-speed manual transmission with Incline Start Assist, while all other trims are mated to a 4-speed automatic with manual shift mode (available on the 2.5X and 2.5X Premium). Notable (trim-dependent) features include a panoramic glass sunroof, 17-inch alloy wheels, automatic climate control, heated front seats, leather upholstery, HD radio, a USB port and Bluetooth hands-free calling/audio streaming. An optional touch-screen navigation system, including DVD capability and integrated backup camera, is offered on Limited and Touring trims. Standard safety equipment includes electronic stability and traction control systems, four-wheel anti-lock disc brakes with brake assist, active front head restraints, front side-impact airbags and front and rear side curtain airbags with a rollover sensor. 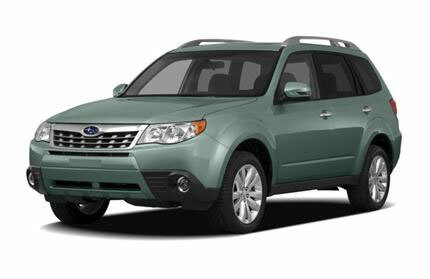 The Subaru Forester carries over unchanged for 2012. Source: Chrome Data. 2012 Subaru Reviews: a no-nonsense mini-SUV for those who need the versatility of a small wagon with the grip of all-wheel drive. -- Edmunds.com.....There's good low-rpm torque available for passing. -- New Car Test Drive.....Subaru makes one of the best all-wheel-drive systems in the world, rivaled only by Porsche and Audi. -- New Car Test Drive........terrific, huge power sunroof that opens over the front and rear seats. -- The Detroit News. Source: Chrome Data.